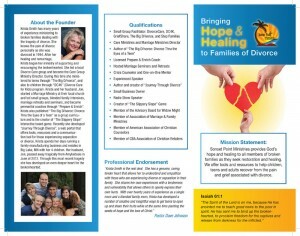 “The Big D” is a program designed to encourage and empower teens to deal with their feelings, fears, and emotions while experiencing the divorce or separation of their parents. It is very common for teens to experience a variety of conflicting emotions during this time. Many react with anger, withdrawal, and intense pain; many carrying these unresolved emotions into their own futures. Because of the divorce or separation of their parents, teens find themselves in a hopeless situation that they did not choose. Many teens carry this “hopelessness” into their futures and any unresolved emotions can carry over into their own families one day. That is where “The Big D” comes in. Whether “The Big D” is experienced in a weekend format or through the 12 week program, a teen will leave transformed and equipped with the God given tools to live a life of hope and the promise of a changed tomorrow.